I am a book blogger/reviewer for A Soul Unsung. I enjoy reading, writing, blogging, and catching up with my latest tv shows. I'm honest, loyal, and caring. I will do anything for my friends & family. Welcome to Book Gossip for the Soul. 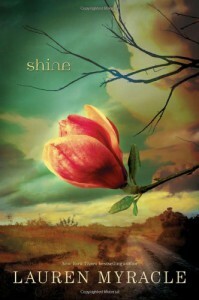 “Stunned residents of Black Creek, North Carolina, pray for seventeen year old Patrick Truman, beaten and left for dead outside the convenience store where he works.” Shine, pp 11 Shine, is the first book I’ve had the pleasure of reading written by Lauren Myracle and I was extremely jazzed about getting the galley for the digital ARC a few days ago. It didn’t take me very long at all to read it. From the first sentence to the last, I was drawn in and was unable to put the book down. In the end, I was not disappointed. From the moment that I read the synopsis provided through goodreads, I decided this was a book that I had to read for many different reasons and I knew that I wouldn’t just be reading for it personal enjoyment, even though I did enjoy it quite a bit. I was truly invested in the storyline and the characters, the depiction of the small mountain town of Asheville, North Carolina, among other things the book seemed to offer. It wasn’t easy reading this book from an emotional stand point, but I do believe that it was a story that needed to be told and Lauren Myracle did a wonderful job of doing just that. From growing up in a small town myself, it wasn’t hard at all for me to look at a few of these characters in question and think to myself, “I know this person; I grew up with someone just like them.” The small town mentality, the poverty, the prejudices, the drugs (meth, which seemed to be the drug of choice featured in this particular novel) and the other issues she touched upon were written very well, delicately handled with aplomb, and illustrated in such a way that it wasn’t hard to feel something other than hatred, something more akin to compassion in a manner of thinking when you stripped the whole story down to the core and just really looked at it – guts and all. The element of mystery the novel provided was there and held strong with each turn of the page. In fact, I was pretty sure that it was one particular character that had done it up until a certain point based on other things that he had done or had happened prior, but then the author surprised me by proving my theory wrong. I was delighted with this aspect. I want to applaud her for bringing to light how backwards that small town was, how ready those people were to look the other way and just bury whatever bad had happened. It was very much a feel of, “don’t go beggin’ for trouble next door, you do best to mind your own” something that I’d grown up hearing on a few different occasions in my life which meant, “Don’t you be drawing too much attention because it could be the wrong kind it’s just not you’re place.” Shine does a wonderful job of illustrating self-loathing, to the point of losing yourself or a loved one to the use of drugs. It’s a very terrifying and lonely place to find oneself in, especially if you’re wielding that self-loathing onto someone else without even realizing that you’ve become the monster that you’ve always protected them from. Which, is why I say that in a way, the story possesses not just hatred, but compassion of some kind for the person(s) lost; I take that away from the book with a line towards the end. “It was right to be sad when sad things happened.” Shine pp 356 I found myself going back and forth on who my favorite character was, but when you get down to it I think I ended up identifying the most with Cat and I quite enjoyed her. I like that she was determined to find out what happened to Patrick and once she did, she was still able to have love and compassion in her heart. Everything isn’t black and white, life just isn’t that simple and nor should it be. Cat’s brother, Christian, illustrates that for reader’s easily. In a town as small as Asheville was, where everybody knows everyone else and gossip is just as prevalent in the Church as it would be in the local beauty parlor, not many choices were easily available to the town’s people and they had to make do or find themselves making nice with other’s they might not normally like. More than anything, I’m grateful that she decided to shine on a light on hate crimes that happen instead of just sweeping them under the rug like yesterday’s dirt trekked in across a linoleum kitchen floor and look the other way out the adjacent window adorning the next wall. It’s hard to read, but it’s worth it. And I truly hope that this book can inspire bravery in others to step forward and to not go “quietly into that good night."